Rabbi Jeffrey Saks is the founding Director of ATID - The Academy for Torah Initiatives and Directions in Jewish Education, in Jerusalem. An editorial board member of the journal Tradition, Rabbi Saks authored Spiritualizing Halakhic Education (Mandel Foundation) and edited Wisdom From All My Teachers: Challenges and Initiatives in Contemporary Torah Education (Urim). He is a graduate of Yeshiva University (BA, MA, Smicha) and participated in the Jerusalem Fellows program for senior Jewish educators at the Mandel Institute. He has taught at the Yeshiva University High School for Girls and Yeshivat Hamivtar. How can the individual seek out God? What is the mystery of Devekut (cleaving to Him)? How does engagement with the natural and spiritual worlds aid us and fail us in our quest? How does God ultimately find us instead? -- These questions stand at the center of Rabbi Joseph B. Soloveitchik's essay "Uvikkashtem miSham" (in English as And From There You Shall Seek), the important sequel and companion text to his monumental Halakhic Man. Prepare for Rosh Hashana and Yom Kippur with Rav Kook’s teachings on the prayers for the High Holy Days. Focusing on his teachings regarding Tefillah (Jewish Prayer), we will mainly be using his siddur commentary Olat Ra'ayah. Aside from S.Y. Agnon’s best selling volume "Yamim Noraim" ("Days of Awe" – An anthology of Torah sources on Rosh HaShana and Yom Kippur), the Nobel laureate featured the High Holy Days in many of his most enigmatic tales. In preparation for the High Holy Days we will look at some of these short stories from a literary perspective, while unraveling the "intertexts" of classical Jewish sources from which Agnon drew, and explore the resonances between text and mastertext. 3-part lecture series on S.Y. Agnon’s stories of Eretz Yisrael. “And in came Rabbi Shmuel Yosef, the son of Rabbi Shalom Mordechai haLevi of blessed memory, who was versed in the legends of the Land of Israel, those legends in which the name of the Holy One, blessed be he, is hallowed; and when he commenced lauding the Land, people could see as it were the name of the living God engraved on the tip of his tongue.” —In the Heart of the Seas Online participation: $20/course. Please click here to pay. Torah learning on WebYeshiva.org in Spring Semester 2017 is dedicated in the memory of Yehezkel and Sarah Lemel z”l by their loving family. יחזקאל בן אשר למל ושאשא יוכבד ז”ל ושרה מניה פייגע בת יום טוב וטשארנה רבקה ז”ל Click here to learn about their inspiring stories and passion for Torah education and Israel. To find out more about dedication opportunities with WebYeshiva.org please contact office@webyeshiva.org. Join us for a 3-part lecture series on S.Y. Agnon’s novel A Simple Story – set in small town Jewish Galicia, a scene of bitter-sweet romance, revealing the profound psychological and social insights of the Nobel laureate’s finest fiction. Please note this course has a fee of $20. The class will meet February 12, 19, and March 5, 2017, and will be broadcast live from Beit Agnon in Jerusalem. Join us for a 3-part lecture series on S.Y. Agnon’s epic novel A Guest for the Night – a nostalgic tale of the old world on the eve of destruction. The work was considered “perhaps his greatest achievement” by the Nobel Committee. The class will meet December 4, 11, and 18, 2016, and will be broadcast live from Beit Agnon in Jerusalem. Prepare for Rosh Hashana and Yom Kippur with Nobel laureate S.Y. Agnon’s tales of the Yamim Noraim. As we head into the 50th anniversary of Agnon’s receiving the Nobel Prize, we will explore the themes he struck in his famous speech in Stockholm, working back to see how they reflected themes in his writings. Each week a different theme will be examined through the prism of a single short story. The cost of the course is $20. What is the role of faith in the life of the Jew? How does faith (emunah) differ from belief? What challenges does modernity pose to emunah and what are the prospects for overcoming them? In this mini-series we will explore the writings of Rav Kook on these topics and gain an insight into the challenges people of faith and people who aspire to faith face and understand more about the teachings of one of the greatest Jewish thinkers of the modern era - Rav Avraham Yitzhak HaKohen Kook zt"l.
Midrash Agnon – English study sessions with R. Jeffrey Saks on Agnon’s writings. Exploring the connection between the Nobel laureate and Rebbe Nachman of Breslov, along with other important influences on Agnon’s writing. Live at Agnon House and online world-wide via WebYeshiva.org/Agnon – Sundays at 7:00pm Israel time. Participate in the course live in Agnon's own house in Talpiot, Jerusalem, or via the simultaneous, interactive, online broadcast via WebYeshiva.org. (Sessions will be recorded and archived for those unable to join in "real time"). The course will cost $45. To pay, please choose from the options below. Join us as we explore a different Agnon story each week, unravelling the magic of the Land of Israel as depicted in Nobel laureate S.Y. Agnon's lyrical weaving of history and mystery into a modern midrash on the link between the Jewish people and Eretz Yisrael in the modern world. PLEASE NOTE: This class will take place at 7:00 PM Israel Time, so although the class will meet at 12:00PM US Eastern on March 4, the subsequent meetings will take place at 1:00 PM US Eastern (March 11 and March 18). Aside from S.Y. Agnon's bestselling volume "Yamim Noraim" ("Days of Awe" – An anthology of Torah sources on Rosh HaShana and Yom Kippur) the Nobel laureate featured the High Holy Days in many of his most enigmatic tales. Explore the role these holidays play in his writing. English lectures with Rabbi Jeffrey Saks – Explore Agnon’s writing while unraveling the "intertexts" of classical Jewish sources from which Agnon drew, and explore the resonances between text and mastertext. Stories will be read in English translation, with references to the original Hebrew text - but Hebrew fluency is not required to participate. Participate in the course live in Agnon's own house in Talpiot, Jerusalem, or via the simultaneous, interactive, online broadcast at WebYeshiva.org (sessions will be recorded and archived for those unable to join in "real time"). Agnon's Days of Awe with Rabbi Jeffrey Saks of WebYeshiva.org and co-sponsored by Lincoln Square Synagogue, NY. Aside from S.Y. Agnon's best selling volume "Yamim Noraim" ("Days of Awe" - An anthology of Torah sources on Rosh HaShana and Yom Kippur) the Nobel laureate featured the High Holy Days in many of his most enigmatic tales. In this two-part series we will look at some of these short stories from a literary perspective, while unraveling the "intertexts" of classical Jewish sources from which Agnon drew, and explore the resonances between text and mastertext. Stories will be read in English translation, with references to the original Hebrew text - but Hebrew fluency is not required to participate. Participate in the course live in Agnon's own house in Talpiot, Jerusalem, or via the simultaneous, interactive, online broadcast at WebYeshiva.org (sessions will be recorded and archived for those unable to join in "real time"). Sundays, September 18 and 25 at 5:30 pm (Jerusalem time). In a blatant rip-off of the popular BBC series (History of the World in 100 Objects - www.bbc.co.uk/ahistoryoftheworld), Rabbi Jeffrey Saks will explore topics in Jewish law and lore through the prism of our material and physical objects - ritual items, tashmishei kedusha and mitzva, art, etc. - to gain insight into halachic practice and Jewish culture. Each session will stand on its own as we travel around the Jewish world and its history. The holy days of Rosh HaShanah and Yom Kippur played a significant role in Rabbi Soloveitchik's halakhic and philosophical writings. A survey of some of these major themes in Rabbi Joseph B. Soloveitchik's thought and religious philosophy as seen through his essays. A survey of some of the major themes in Rabbi Joseph B. Soloveitchik's thought and religious philosophy as seen in his shorter essays. Midrash Agnon – English study sessions with R. Jeffrey Saks on Agnon’s writings. Stories of the Old World and Agnon’s ancestral Buczacz as depicted in his ‘Ir uMelo’ah. Live at Agnon House and online world-wide via WebYeshiva.org/Agnon – Sundays at 7:00pm Israel time. Participate in the course live in Agnon's own house in Talpiot, Jerusalem, or via the simultaneous, interactive, online broadcast via WebYeshiva.org. (Sessions will be recorded and archived for those unable to join in "real time"). The course will cost $40. To pay, please choose from the options below. The cost of series for those participating at Beit Agnon is NIS40/per lecture or NIS160 for full 5-part series. In this mini-series we will explore Nobel laureate S.Y. Agnon's story “Shnei Talmidei Hakahamim Shehayu Be’Irenu” (Two Scholars Who Were in Our Town), which is a nostalgic, elegiac, yet also ironic recounting of a time when “Torah was beloved by Israel and the entire glory of a man was Torah, when our town was privileged to be counted among the most notable towns in the land on account of its scholars.” And yet, as the plot unwinds and insults are traded in the Beit Midrash, the reader is led to the tragic denouement. And here we see Agnon’s power as a tragedian on an almost Greek scale. With his typical irony at work, the narrator pines for an earlier, more ideal time which turns out to have been rife with flaws and tragic personalities of its own. This draws the reader to question – was it always ever thus? The story is now available for the first time in English in a new translation from the Toby Press. The cost of this course is $40. S.Y. Agnon's novella "In the Prime of Her Life" (Bidmei Yameha) is a tale of love lost and found, and the profound way the older generation shapes the life of its children, as told through the perspective of a young female narrator. This biblical and lyrical weaving of a modern and complex Hebrew love story will be explored in our 3-part mini-series on the Nobel laureate's novella with Rabbi Jeffrey Saks. We will enjoy the story from a literary perspective, while unraveling the "intertexts" of classical Jewish sources from which Agnon builds his writing. "In the Prime of Her Life" will be read in English translation, with references to the original Hebrew text - but Hebrew fluency is not required to participate. Sundays, May 12, 19 and 26 at 7:00-8:30 PM Jerusalem time. Participate in the course live in Agnon's own house in Talpiot, Jerusalem, or via the simultaneous, interactive, online broadcast via WebYeshiva.org. (Sessions will be recorded and archived for those unable to join in "real time"). The Hebrew text of the story appears in Agnon's volume Al Kapot HaManul. The English translation is available in Eight Great Hebrew Short Novels (Toby Press). Electronic copies will be available for those who register for the course. Cost: $25 for the series. Rav Aharon Lichtenstein (1933-2015) zt"l, who recently passed away, Rosh Yeshivat Har Etzion, was a leading figure in the Modern Orthodox world - as a teacher of Torah, a thinker and philosopher, and as an exemplary servant of God and human being. This course will survey highlights of his writings on Teshuva. His writings in English have been anthologized in a variety of volumes and on the website of his yeshiva. Join us for a 5-part series on S.Y Agnon, Nobel Prize Laureate for Modern Hebrew literature. We will enjoy Agnon's stories from a literary perspective, while unraveling the "intertexts" of classical Jewish sources from which Agnon builds his stories and explore the resonances between text and mastertext. Stories will be read in English translation, with references to the original Hebrew text - but Hebrew fluency is not required to participate. Agnon's writing explores an array of questions to sensitive readers - theological, cultural, spiritual - such as: the viability of Judaism in the Diaspora, the continuity of tradition in the face of modernity, the challenge and meaning of the return to Eretz Yisrael. Participate in the course live in Agnon's own house in Talpiot, Jerusalem, or via the simultaneous, interactive, online broadcast via WebYeshiva.org (sessions will be recorded and archived for those unable to join in "real time"). We recommend buying A Book That Was Lost: Thirty-Five Stories by S.Y. Agnon (The Toby Press), available for online purchase here. Is mankind meant to master its surrounding or submit passively to God? What is the place of Jewish faith in the modern world? How does modernity pose a challenge to religious life? What is the viability of forming community today? These questions stand at the center of Rabbi Soloveitchik's masterful "The Lonely Man of Faith" and we will continue to explore them as we make a close reading of the essay and exploration of the sources on which the Rav zt"l drew in composing one of the 20th century's most significant treatments of religious philosophy and Jewish faith. Although this class is a continuation of the course from Summer 2011, available here, new students are encouraged to join, as they will be able to follow along and participate without having been present for the first semester. 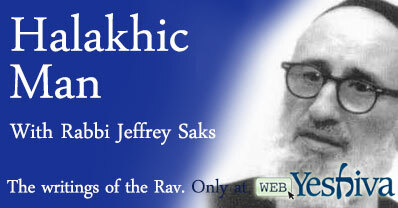 Explore the Rav's magnum opus with Rabbi Jeffrey Saks. "Halakhic man reflects two opposing selves; two disparate images are embodied within his soul and spirit." Who is this complex character and what does he tell us about the spirit and ideals of halakhic Judaism, and the philosophical worldview of the Rabbi Joseph B. Soloveitchik zt"l? In 5708 (1948), the course of Jewish history was changed. Or was it? The controversy over Israel’s Jewish nature began before the State was even born. Was declaring Israel as the Jewish State merely a compromise to the religious right, or was it an event of religious and historical significance for the Jewish people – religious and secular alike – throughout the world? The cost of this seminar is $35 USD. S.Y. Agnon's novella "In the Heart of the Seas" (Bilvav Yamim) is a legend of love for the Land of Israel as a group sets out from 19th century Buczacz on Aliya, accompanied by a mysterious and miraculous man of spirit. This midrashic and lyrical weaving of history and mystery will be explored in our 3-part mini-series on Nobel laureate S.Y. Agnon's novella with Rabbi Jeffrey Saks. Sundays, Novmber 27th, December 4th and 11th at 7:00 PM Jerusalem time. The Hebrew text of the story appears in Agnon's volume Eilu veEilu. The English translation (by I.M. Lask) is available online at Google Books and for sale in various online retailers. Rav Aharon Lichtenstein (1933-2015) zt"l, who recently passed away, Rosh Yeshivat Har Etzion, was a leading figure in the Modern Orthodox world - as a teacher of Torah, a thinker and philosopher, and as an exemplary servant of God and human being. This course will survey highlights of his writings in the field of Jewish Thought. His writings in English have been anthologized in a variety of volumes and on the website of his yeshiva. A careful reading of different short stories by the Nobel laureate, exploring the complex connections between S.Y. Agnon the man, the author, and the narrator he created. Each week will examine a different story (new translations will be made available). With R. Jeffrey Saks – 5 Sundays in a row starting January 25, 2015 at 7:30pm Live at Beit Agnon and online everywhere from WebYeshiva.org/Agnon Cost: Live attendance at Agnon House: NIS35/session or NIS150 for 5-part series. Online registration: $35/course. A survey of Jewish prayer as discussed in Rabbi Joseph B. Soloveitchik's thought and religious philosophy. All are welcome to join. Rambam's introduction to Pirkei Avot explores the nature of personality development. What is the mechanism by which we can improve ourselves? Can human perfection be achieved? This course has now been accredited to triled.com (Theological Research Institute). Is mankind meant to master its surrounding or submit passively to God? What is the place of Jewish faith in the modern world? How does modernity pose a challenge to religious life? What is the viability of forming community today? These questions stand at the center of Rabbi Soloveitchik's masterful "The Lonely Man of Faith" and will be explored as we make a close reading of the essay and exploration of the sources on which the Rav zt"l drew in composing one of the 20th century's most significant treatments of religious philosophy and Jewish faith. This class is dedicated to a Refuah Shelaima (full recovery) for Stella Frankl, Tzuriya Kochevet Bat Sarah. An overview of major topics in Modern Jewish history, including Emancipation and Enlightenment, and their impacts on Jewish life, culture, and observance; Zionism and the State; Modern anti-Semitism and the Holocaust. This ambitious agenda will be pursued through an encounter with primary sources, and with thinking about how our lives as contemporary, religious Jews is affected by the events of the past 250 years. Using Rambam's introduciton to the Mishna as our guide, we'll explore how the Oral Law came to be from the moment Moshe came down from the mountain, thourgh the Talmud, and beyond. PLEASE NOTE: This class requires a minimum of 10 paying students in order to ensure its continuation this zman. Using Rambam's introduciton to the Mishna as our guide, we'll explore how the Oral Law came to be from the moment Moshe came down from the mountain, through the Talmud, and beyond. PLEASE NOTE: This class requires a minimum of 10 paying students in order to ensure its continuation this zman. An overview of major topics in Modern Jewish history, including Emancipation and Enlightenment, and their impacts on Jewish life, culture, and observance; Zionism and the State; Modern anti-Semitism and the Holocaust. This ambitious agenda will be pursued through an encounter with primary sources, and with thinking about how our lives as contemporary, religious Jews are affected by the events of the past 250 years. Maimonides' wrote that whenever the aggadot in the Talmud seem far-fetched and beyond rational understanding, it is our duty to carefully analyse and immerse ourselves in them until we come to understand the concepts they come to teach us. This class will explore Maimonides' introduction to Perek Chelek, the eleventh chapter of the Talmudic tractate Sanhedrin, which deals with Olam HaBa (the World to Come), Midrash, and the Foundations of Faith. A basic-level gemara shiur that aims primarily to improve the student's ability to logically parse a gemara sugya. Main focus is on the Gemara text itself, with some use of Rashi, Tosfot, and other Rishonim or commnetaries which help us in our work of engaging the Talmudic back-and-forth. The shiur is appropriate for students with a range of backgrounds who want to improve their skills working with a page of Gemara, and at the same time want to be able to understand "Talmudic thinking" and the way Chazal undertook their great enterprise.